Do you know that if you let yourself be blamed too much it is likely to damage your love relationships with everyone you love? That is true whether or not you are at fault for the various things you get blamed for. How can that be true, you wonder? Here is how. 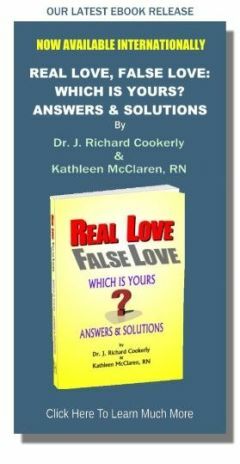 Hearing and taking in a lot of blame can undermine your healthy self-love and that will negatively impact all your love relationships. Hearing and taking in a lot of blame can undermine your belief in yourself and cause you to increase your own self-blame. That can turn into a blame ridden, self fulfilling prophecy mechanism whereby you do more and more things that will get you blamed more and more. Hearing and taking in a lot of blame also can teach you to have a very defensive mindset. That in turn can make you hear blame where no blame exists and become defensive when defensiveness is not called for. Defensiveness often leads to arguments and emotional distancing from the very people you want to be close with. That can push people toward an increasingly negative view of life, of people and maybe of relationships in general. All of that can damage our love relationships, not to mention our health. Do you know whether or not you do a lot of blaming? 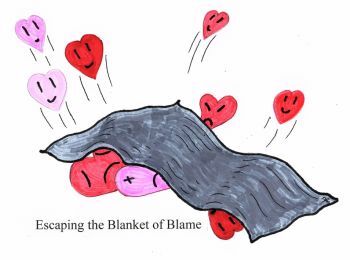 Many very blame-oriented people have no idea that they are seen as overly blaming. Blame, even when it is justified, accurate and fair can create emotional distance, resentment and animosity between people who love each other. That is true even if blamers think they are blaming those they love to help them be better people. If you are viewed as too strongly or too frequently prone to talk in a blaming way, those you love and others likely will want to be around you less and less. Do you think you might be one of those people who gets blamed for everything, and have since you were a kid? Some children in some families are subconsciously given the role of the “garbage can kid” and they do get blamed a lot, more than their siblings. This is true even though their siblings do as many things wrong as they do. That subconscious mechanism can become a self-fulfilling prophecy mechanism for a person in their adulthood. If you unknowingly act guilty, give off “I’m the one to blame” little clues, you can live trapped in this role. If you are easy to blame, maybe because you submit a lot, if you are a blame target just because you are handy, or if you are fun to blame because of how you react, you accidentally can be rewarding others for blaming you more. Remember, rewarded behavior tends to increase. A lot of people do a lot of blaming just because that is what they grew up around. In a way, it helps them feel like they are ‘at home’. Sometimes it helps them feel like now they get to be one of the powerful, blaming parents instead of the more powerless, blamed child. Blame often is a fairly poor way of complaining and an even less effective way of requesting some sort of change. Blame also is often involved in playing the subconscious ‘ego game’ “I’m okay and you’re not okay, so I’m better than you”. Blame can be a way to try to control another, usually with guilt. Blame also can be an offensive defense. If I blame you first I may block you blaming me. A lot of blame is fear-based. If I secretly fear change, For example: I can find fault with you who wants change even if that change is improvement. Sometimes blame is a poorly executed attempt to gain more love. Here is an example. If I blamefully say, “You really are such a lousy lover”, I am likely to be trying to say “I really want you to show me more love, more often, and more in the ways I like, maybe especially sexually”. If I already have made that request and did not get much of a favorable response, I may in frustration change my request to blame to add power to my request. Otherwise I might say it just because that is my speech habit to talk that way or because I don’t know how to say it in a more loving way. Blame also can be a way to try to get someone to feel bad for your pain, understand your pain, to get them to indicate they are sorry for your pain and that they will try to help you avoid that pain in the future. That is all part of healing love. Too often that is not understood and it backfires into counter-blame attacks and useless rationalization or a retreat from interaction. Most things can be said in ways that are better than blame-filled statements which in many cases only result in counter-blame arguments. One of the problems with blame is that it focuses ‘on the past’ where change is not possible and ‘not on the future’ where improvements are possible. Another problem is that blame is focused on who is at fault instead of who is going to fix something or make something better happen. The third problem with blame is that you can get lost in ‘who did’ what, when, where and why. That in turn may get you to totally avoid ‘who will do’ what, when, where and maybe why which can facilitate improvement. Blame also can trigger people to use up a lot of energy and time in useless, or worse, counter-productive behavior. Wasting your time with anger, coming up with reasons and evidence proving the other person is wrong and you are right, that you really did not do what you are being blamed for, having to win, getting depressed and embroiled in a inconsequential drama, all that and more can be triggered by blame and sabotage love. All in all, blame turns out to be a frequently poor way to go about improvement, especially in love relationships. Look at the word ‘responsibility’. It is made up of the words ‘response’ and ‘ability’. That is to say, the word implies ‘respond ably’ i.e. ‘make something better’. If you did something wrong, being de-energized by feeling bad about yourself for doing that might possibly help in you to not do it again. But more importantly, how are you going to make amends, make some sort of improvement, learn from it and go forward better and stronger. It is suggested that is the better meaning of ‘taking responsibility’. Usually much better than blaming somebody for something is simply and clearly requesting what you want instead of what you got. In really important things, you also can insist on what you want. Consider this statement. “I don’t want you to feel guilty or beat up on yourself. I want you to feel empathy for how I hurt, and I want you to feel determination to help me not have that kind of pain again in the future”. Now consider, “I want you to hurt forever, feel ashamed, guilty and lousy, and beat up on yourself a lot for what you did to me. And don’t ever stop doing that”. Saying the second statement might help you release your hurt better but the first statement more likely will get you better treatment right away and in the future. Try this. Instead of blaming, explore together what happened with non-blaming questions while considering the likelihood that it actually took ‘both of you’ to create whatever you want to blame the other one for. At least to some extent, it almost always is true that whenever something goes wrong both people in a love relationship were causative in some way or another, not just one. One person may be the more obvious, overt and easily identified perpetrator but the other one likely may be passively, covertly and subconsciously a contributor to whatever the blame is all about. Then even more importantly, identifying how you both can do loving teamwork to make improvements is what turns out to be the most successful approach. Who from, how, where, when and maybe why were you taught the giving and getting of blame?